A week ago today 8 of the world’s best wave sailors - Jaeger Stone (Starboard / Severne / SWOX / Shamal Sunglasses), Philip Köster (Starboard / Severne / Maui Ultra Fins), Leon Jamaer (JP / NeilPryde), Robby Swift (JP / NeilPryde / SWOX), Ricardo Campello (Brunotti Boards), Thomas Traversa (Tabou / GA Sails), Adam Lewis (Fanatic / Duotone / SWOX) and Dany Bruch (Bruch Boards / GA Sails / AL360) - set out to conquer Storm Gareth in Ireland after the Red Bull Storm Chase finally received the much awaited green light after a 3 year wait. Hey Jaeger, has it settled in now that you just won the wildest RBSC yet? Nah, not really! It makes me really happy when I think about it but I have definitely had to double check a couple of times. How hard was it for you to go from hot Aussie summer to freezing cold Ireland, both mentally and physically? Yeah, it was a little difficult to be honest. We had been on hold for about a week, I pushed my flights to Maui back and the forecast was really inconsistent so I felt like I was going through a lot of emotions with the anticipation of it all. Once it was all called on I guess I just decided to go with the flow of it all. Before I came over to Ireland one of my biggest concerns was going to be how I handled the cold. I spoke to a few of my mates and basically said I wasn't sure if I would be able to move or how I would react as it's so different to anything I know. That was definitely a massive challenge. I think in the moment you have so much adrenaline and determination you push through and find ways to deal with it. Everyone was in the same boat. When it’s all over though I think you realise how hard you push your body. I’ve been quite sick since I got home but it has all been worth it. When it got given the green light and you saw the forecast were you excited or a bit precautious? It was a real mix of feelings. I waited up until 10pm the night before to see if they had made the call and was just getting my girlfriend Carla to check my phone. Nothing came through though so I went to sleep. When I woke at 6am I checked my phone and they had pretty much called it on about 5min after I went to bed. I’m glad I didn’t see the message as I’m sure I wouldn’t have slept. I was quite relaxed that morning though, excited but also nervous for the unknown. 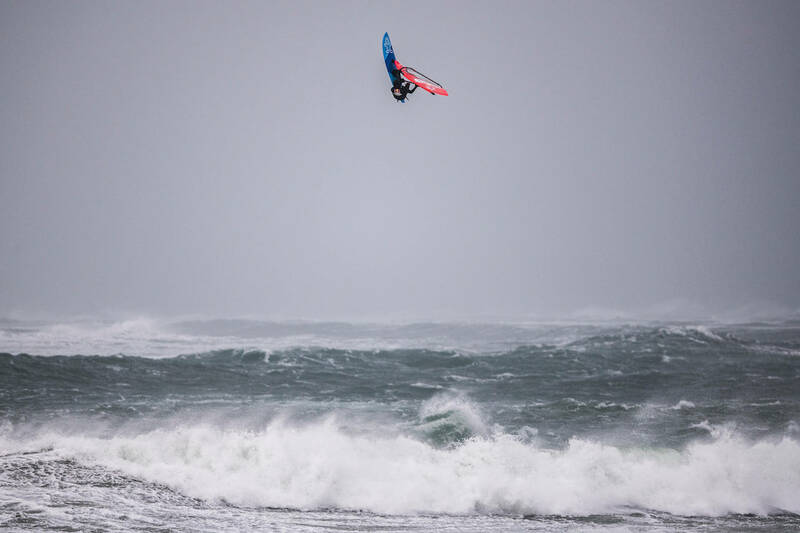 Was that the windiest and biggest conditions you’ve ever sailed? Can you try and put into words just how gnarly the conditions were? Without a doubt the windiest I’ve ever sailed. At times I couldn’t even keep my board in the water or sail in a straight line. It was out of control. The waves weren’t the biggest I’ve ever been out in but coupled with that wind strength it was mental. On the second day there were some absolute nuggets coming through on the outer reef and the ocean just felt so wild and violent. I think that in itself was pretty tough to deal with, but it was so cold we could hardly feel our hands and then had rain, snow and hail storms on top. When it’s that cold and wild - was it tough to mentally make yourself try and push yourself to perform the most radically you can? Yeah, for sure. We sailed 3 rounds on each of the 2 days and it was so cold that it definitely took some motivation to get out of the warm car and back in to the water. The conditions were extremely uncomfortable at times, both on and off the water, but once you’re out there adrenaline soon kicks in again. Sailing with those other 7 guys, everyone is pushing so hard it definitely inspires you to try and go as big as you can. What size gear were you on when the conditions were at the windiest? Did you have special custom boards made for the RBSC and what fin setup did you sail? I used my custom 3.0 Severne S-1 Pro and swapped between my 72L Starboard Ultrakode and custom 76L Ultrakode. My custom 76 was built for big waves and strong cross-off winds which is basically what we sailed in for most of the day when Storm Gareth hit. I sailed my boards as a thruster with an 18cm rear fin and 11cm side fins. How was the experience for you as a whole? It was awesome. It was so fun hanging out with all the sailors and RBSC crew. Ireland is a beautiful place, the people were super friendly and the entire trip was an experience I’ll never forget. Philip Köster (Starboard / Severne / Maui Ultra Fins) - who finished 2nd added: “It was the biggest challenge ever to sail in winds over 100kmh together with waves all over and the freezing temperatures. I am really happy though that the storm chase got done in these conditions! I had a lot of fun also watching the others sailing. I think it was definitely the windiest I haver ever sailed, I had as smaller 3.5 which I can hold on to quite a bit but sometimes during the event it was almost impossible to go in a straight line." When asked about the huge stalled forward photo, Köster said: “I’m not sure If I have done any bigger forwards but it is definitely in my top 5 high jumps, I thought about only doing a straight jump but since it was a contest I decided to hang on a forward at the end, bit of a back slap but still pretty stoked on that one.